Chef Christian Ramos, a Per Se alum, cures Atlantic Scottish salmon in citrus and salt for six hours, and then pairs it with honeydew-melon soup, mint, cured cucumbers, and pickled fennel. On a recent visit, the ceviche was made with porgy, cucumber, and tobasco, but the type of fish varies based on the Dock to Dish delivery. Untitled is a lovely for a sit-down meal, but chef Michael Anthony is also overseeing the more casual upstairs café. The menu is dominated by toasts, like this one with arctic char, potatoes, capers, and crème fraîche. Pastry chef Jessica Yang — who just got named to Zagat’s 30 Under 30 list — recently debuted a dessert of poached peaches, lavender granite, and tapioca. New York Times critic Pete Wells is a fan of this refreshing salad, with charred cucumbers and razor clams. 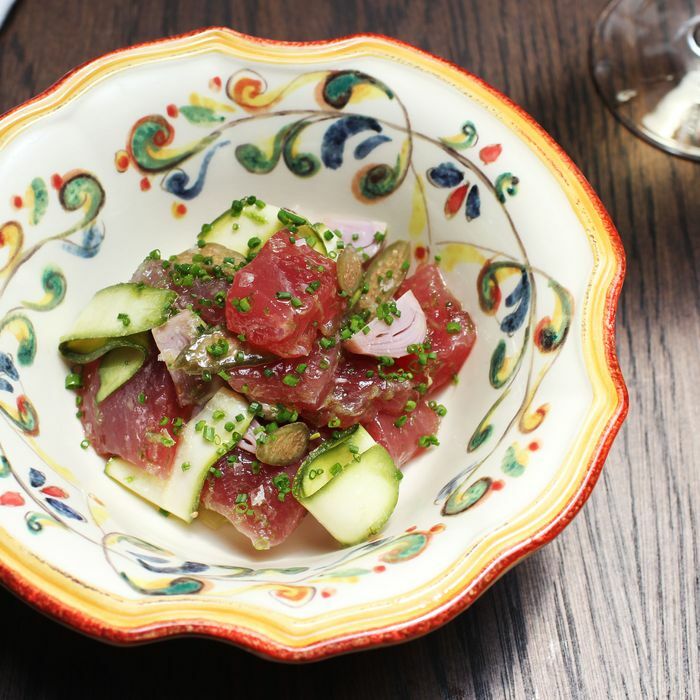 This pretty new Soho restaurant is a crowd-pleaser, and that’s in part because of solid, simple dishes like tuna crudo, with zucchini, lampascioni, caperberries, and lime. Sitting outside during a heat wave is rough, but if you’re one of those New Yorkers who will do anything to dine alfresco, Alta Linea (a seasonal outdoor restaurant) is just the place. 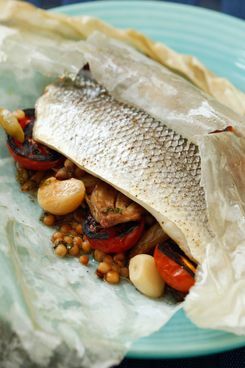 This entree comes wrapped with olives, fregola, fennel, and garlic. New to the menu at Cómodo is an ultralight shrimp ceviche, served over sliced avocado in a spicy orange-aji Amarillo “leche de tigre” (a traditional Peruvian preparation) with chopped mint and toasted cashews. There’s much to like at James Murphy’s wine bar — spicy beef jerky, warm bread, a solid roast chicken — but this vegetarian dish is certainly the most refreshing and just as satisfying as the meatier options. This new Tribeca restaurant, helmed by a Prune vet, seems to be an easy option for summer, with snack-y dishes like fried fava beans and a little-gem salad. The structure of the Contra team’s new restaurant makes it perfect for summer dining: order a bottle of natural wine, perhaps a few small plates, and then a few more — no pressure. During lunch, chef Hooni Kim’s kitchen turns out this Korean specialty, with pickled cucumbers, cabbage, and egg. Kim says that in South Korea, people are as crazy for this dish as people in Japan (and the U.S.) are for ramen. Chilled soups are springing up on plenty of menus, but it’s hard to get behind a cold bowl of pureed asparagus. Corn soup, on the other hand, is wonderful — especially when prepared by chef J.J. Johnson. Pastry chef Jennifer Yee’s artisanal push-pops have exploded, and she now offers four flavors: the original Tout-ti Frutti (with sherbet and crushed macarons), Cannele, and dairy-free Mango-Lime and Blackberry Verbena. You can even purchase a cooler, which comes with 15 pops and costs $195.